As in Glossary per chapter or section, I'm trying to use the glossaries package to create acronym lists but only by chapter, not by section. 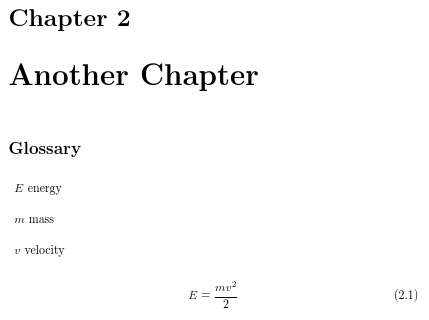 I've tried to adapt the answer, but I don't manage to do it. 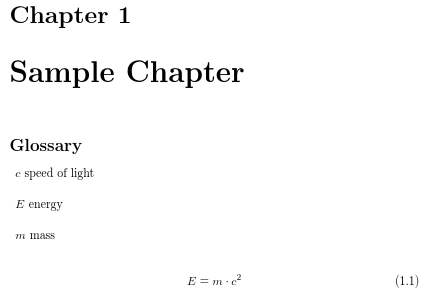 How can I remove the glossary entry about velocity in the first chapter and the one about speed of light in the second chapter ? The problem here is that you're mixing old and new commands. My original answer that you linked to is several years old and uses commands that are now deprecated, such as \glossarystyle and \glossaryentryfield. Your MWE has changed the deprecated \glossarystyle to \setglossarystyle but hasn't changed the deprecated \glossaryentryfield. By using the new \setglossarystyle, the backward-compatibility is removed and \glossaryentryfield isn't used. Not the answer you're looking for? Browse other questions tagged glossaries subdividing or ask your own question. How to create glossary entries for custom notation with arguments?